The Mousehole Christmas Lights (from 17th December 2016 to 7th January 2017) are beautiful Christmas lights in Cornwall and Mousehole is a great place for a festive wander, whilst you are there you can pop into the The Old Coastguard restaurant/bistro and bar which is a great place to relax with an absolutely fabulous sea view. Padstow Christmas Lights in Cornwall (from 27th Nov 2016) are also special. You can see the perfect harbour village of Padstow glowing in a beautiful Cornwall Christmas light display including lights in the harbour waters and then head for The Old Ship to warm up with a drink in the bar or some delicious seafood. Or the St Ives Cornwall Christmas Lights switch on is on 20th Novemeber 2016 with music and entertainers from around 5pm. There are lots of great Christmas light displays in Cornwall so make sure you get to enjoy some. Enjoy a traditional, or not so traditional, Christmas meal out in Cornwall. From turkey followed by Christmas pudding to some local seafood delights, there is lots on offer. Many of the Cornwall restaurants have special Christmas menus, evenings and even party nights so start the celebrations the tasty way. The Water's Edge restaurant at the Greenbank Hotel in Falmouth has stunning harbour views and offers the perfect way to celebrate welcoming Christmas parties in Cornwall from 2 to 120. Offshore Bar and Bistro near Newquay has a special Chrstmans party menu which looks fabulous and is also a great place to enjoy coffee, lunch or dinner over the winter months with the dunes and sea as a backdrop. And Willow Cafe/Bistro in Perranporth has a delicious looking Christmas menu with tasty vegetarian option and it is a dog friendly place to eat in Cornwall and so everyone can celebrate! Cornwall is an excellent place to spend Christmas. Whether you choose to relax for a week, use the time catch up on Christmas shopping in Cornwall with a difference in some of the great local shops or have a Christmas short break in Cornwall there is lots to do and lots of Christmas events in Cornwall going on and so you are sure to have a memorable break. There is lots of excellent Christmas accommodation in Cornwall the hard part is deciding which to choose (you could always spend New Year in Cornwall as well!). Latitude50 offer excellent self-catering properties in Cornwall in Rock, Daymer Bay, Polzeath and Port Isaac or Mullion Cove Coastal retreat on the Lizard has luxury accommodation in Cornwall which is cozy whatever the Cornish winter weather as does Piran Meadows near Newquay. The Valley near Truro offers family friendly and dog friendly accommodation in Cornwall with Luxury 5 star self-catering cottages in un spoilt Cornish countryside. Cornish Traditional Cottages offer a good selection of hand-picked holiday properties in Cornwall and for those planning a large gathering Scotts Castle Holidays have fabulous larger properties. Or, for great family friendly accommodation in Cornwall The Sands Resort is near the beach and has fantastic sea views or Wooda Farm near Bude has lots going on for Children. Join in the Christmas celebrations at one of the many Christmas late night shopping in Cornwall events. In Truro there is a street market, lots going on and a great Christmas atmosphere (Christmas late night shopping in Truro is on Wednesdays 30th Nov, 7th, 14th and 21st Dec 2016). Other towns such as Bude and Penzance also hold late night shopping Christmas events. Visit one of the many Christmas food markets selling local produce for some special Christmas treats or a craft market for gifts with a difference such as the Mcmillan Christmas Fair on 17th November 2016 at the Eden Project. Or, for some excellent locally made goodies and a Cornish tipple to accompany your Christmas visit Healeys Cyder Farm. You can enjoy a look around the farm and see how the cyder is made at the same time. For a fabulous Christmas Cake their are lots of great cake makers in Cornwall. For more ideas the Saffron Trading Company are holding Cornwall Christmas events in Camborne on Saturdays until 17th December 2016 with quality stalls with locally made, handcrafted gifts, artists and lots going on. Or on 17th and 18th December 2016 there is the Cornish Christmas Gift and Food event in St Johns Hall Penzance held by Make Industries where everything will have been made in Cornwall. St Ives Farmers Market, Bude Farmers Market and Pendeen Farmers Market are all regular markets and are great places to stock up on good quality local produce and Christmas Food in Cornwall. Lots of the Christmas events in Cornwall include seeing Santa. 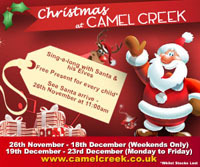 Santa will be at Camel Creek Adventure Park at weekends from 26th November and all days between 18th and 23rd December. You can see Santa arrive at 11.00am and enjoy a sing-a-long with Santa and his Elves and a free present every child - not to mention all the great rides, indoor activities and fun things to do at Camel Creek as well - let the children run off some of that Christmas excitement! Father Christmas arrives in Fowey amongst an evening of festivities to start the Fowey Christmas Market Cornwall which is a Christmas event in Cornwall with markets, entertainment, food and drink and Santa. Santa will also be putting in an appearance at many other places throughout Cornwall. Or the Cornish Christmas Bear Fair at Lostwithiel looks like good fun. And, St Austell Torchlight Carnival is a lively and varied Christmas family event in Cornwall which marks the beginning of winter. There is also Dickensian Evening AT Lostwithiel and Christmas Festival at Padstow (1st Dec until 4th Dec 2016). And don't forget Truro Mayor's Charity Day on 10th December 2016 - this Cornwall Christmas event will see Lemon Key come alive with charity stalls from 8.30am until 5pm. Spend New Years Eve in Cornwall. There are some excellent New Years celebrations going on. Many of the towns and villages come alive with party goers in fancy dress, gatherings at a focal point for the countdown to midnight and fireworks. 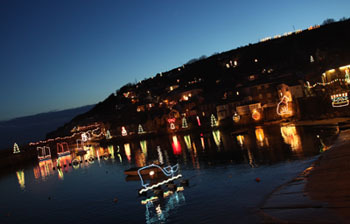 The villages of St Ives, Polperro, Newquay and Looe are all known for their New Year festivities. There are also lots of fantastic hotels in Cornwall putting on New Year theme events and dinner dances, have a look at the many hotels in Newquay or across Cornwall. Support one of the Santa Fun Runs in aid of Cornwall Hospice Care or Children's Hospice South West taking place throughout Cornwall. For dates and more information see the listing in the Events Calendar below. Cornwall Hospice care Santa Fun Run Cornwall Christmas events will be taking place throughout Cornwall on the following dates - more details in the Christmas What's On Calendar below. For the brave join in an organised Christmas Day or Boxing Day Swim in the Cornish sea or the not so brave watch one with a hot chocolate. Swims usually organised at BudeandSennenon Christmas day and Charlestown on Boxing Day. The sea is dangerous especially in winter - only swim at a lifeguard supervised event. There are lots of Christmas Carol events in Cornwall To highlight a few there is the BBC Radio Cornwall Carol Concert in Truro which is a popular Christmas concert each year. Listen to BBC Radio Cornwall for details of when and how to apply for tickets. Or, TRURO'S BIG CHRISTMAS SING at Truro Cathedral. A Festive Christmas event in Cornwall where you can enjoy an evening singing your favourite Christmas Carols and get the festive season off to a melodic start. For something a bit different try the CHRISTMAS CAKE COMPETITION IN AID OF CHILDREN'S HOSPICE SOUTHWEST taking place at Magic Moments by Sonia Cake shop in St Austell, from Tuesday 1st December 2015 11am until 24th December. A best decorated Christmas Cake competition! Relax in a Spa the Legacy Hotel Victoria has Spa packages and Spa breaks in Cornwall to help you get tip top for the festivities or simply relax with some me time. If you fancy getting away from it all you can wrap up warm and take a bracing winter walk on one of the beautiful beaches, and along the Coast path or in one of the beautiful parks or gardens Cornwall has to offer and then find a cozy pub, cafe or restaurant with a great sea view of the Atlantic coast and watch the wild winter sea and crashing waves. The Gurnard's Head is a great pub near St Ives with great walks nearby (or forget the walk and just enjoy the food!) and at the Seaview Inn in Falmouth you can enjoy views whilst being settled next to roaring fires, great for drinks or reasonably priced food. Heartlands is a different place to walk around with lots of different things going on, children's play area and tasty cafe. You may even get to see the Cornish beaches covered in snow - a perfect Christmas picture. View our Calendar of Christmas Events below for full details of events, lots more ideas and to see what is going over the Christmas period in Cornwall. We have listed events in November and December so you can plan your Cornish Christmas diary. If you would like to list a Cornish Christmas event please contact us. St Erth Christmas Fair will take place on Saturday 21st November in the Methodist Hall at 2.30. Various stalls, raffle, tombola, refreshments. Father Christmas will be in attendance. Hayle Christmas Lights Switch on - 7pm Friday 25th November at Hayle Daycare Centre. Entertainment and Refreshments. All welcome at this West Cornwall Christmas event, family friendly. It's £12 for adults and £7 for children, or £15 and £10 to take part in the Wadebridge Santa Cycle and then the Padstow Santa Run that are on the same day. Lovely event for Christmas in Cornwall giving you the opportunity to remember your family and friends by placing a star on a Christmas Tree. This event will take place at Tesco Carbis Bay from 10 am to 4pm on 26th November 2016 and all proceeds raised will go to Children's Hospice South West, Little Harbour. Oganised by Hayle Friends Group. Traditional Christmas event in Cornwall. The beautiful Christmas Lights at Padstow are switched on Sunday 27th November 2016. The Padstow Christmas Lights will be turned on from about 6pm. To accompany the switch on and get everyone in the Christmas spirit there is usually a carol service performed by the Padstow Carolers on the band stand. The Padstow Christmas Lights are a real Christmas treat, there are pretty lights all around the harbour and floating in the harbour water taking various forms including a whale, boat and Christmas trees to name a few. The Padstow Christmas lights are a great example of what's on in Cornwall at Christmas - worth a visit! Late night Christmas Shopping in Truro when the shops are open until 9pm and there is a festive street market from 5pm until 9pm. Takes place on Wednesday evenings running up to Christmas. There are entertainers, brass bands and carol singers all adding to the Christmas feel in Truro. Made in Cornwall Christmas Fair 30th November to 4th December 2016. A real Christmas event in Cornwall for all the family showing locally made and produced crafts and products - all Cornish of course! Held in a large marquee in Truro stall holders sell only products which are made in Cornwall and have been awarded the Made in Cornwall Logo and so it is a great opportunity to see some of the excellent Cornish products including crafts, art and food and drink. A great opportunity to do some Christmas shopping and find some unusual Christmas gifts from food hampers filled with gourmet delights to beautiful jewellery. The popular Fair offers the chance for members of the public to buy genuine Cornish gifts and food for Christmas. Alongside the established favourites there will be several new faces belonging to young artists and artisans. In all 100 local businesses will be taking part. The Made In Cornwall Christmas Fair will be held on the Piazza in Truro and will be open from 10.00am to 9.00pm on Wednesday 30th November to incorporate the late night shopping evening, from 10.00am to 5.00pm from Thursday through to Saturday, and from 10.30am to 4pm on Sunday. Admission is free. A series of very special Christmas events in Cornwall. Light Up a Life is one of Cornwall Hospices best loved and most meaningful community events during which people can come together to cherish and celebrate the memories of those we have lost. Each service features carols, readings and prayers. Lights on a Tree of Life will symbolise the lives of the special people we are remembering. Light Up a Life gives people the opportunity to remember their loved ones by placing their names in one of our remembrance books (you can do this online) and attending one of our dedication services. Services this year will be at St Julias Hospice, Truro Cathedral, St Mary's Parish Curch Launceston, Chapel Street Methodist Church Penzance and Mount Edgcumbe Hospice. At the end of each service the lights on the tree will be lit as a symbol of remembrance. Winter Getaway - stay and save from £99 per night until end of March 2017 at this lovely hotel by the sea in Cornwall. With rooms from just £99 per room per night for any length of stay, inclusive of bed and breakfast with an added treat of a mini Cornish cream tea in the Water's Edge Bar or drink in the Working Boat pub on arrival. Offer does not apply over the Christmas/New Year period from 22nd December 2016 to 1st January 2107. Marazion School invites you all to our annual Christmas Fair. There will be a large number of local stall holders selling lots of fantastic Christmas must haves together with lots of perfect present ideas. Hot food and refreshments will be available to purchase and our lovely cake stall always proves popular! There will be a fun tombola and a wonderful raffle packed with prizes galore! Not forgetting....A visit from Father Christmas and much more! A real family friendly Christmas event in Cornwall for all of the family to enjoy. One of several Christmas themed things to do in Cornwall this weekend. On Friday 2nd December 2016 Krowji will be glittering and shimmering with Festive delights as its artists and jewellers, ceramicists and craft workers throw wide their doors for the famous Christmas Open Studios. This event in Cornwall runs from Friday to Sunday 4th Christmas Open Studios is an artist-led event taking place just at Krowji and is separate from Open Studios Cornwall when artists open their studios as various venues across Cornwall. Its a great chance to meet talented artists and makers and get some different and creative Christmas gifts. Looe Christmas Festival will take place from Friday 4th to Sunday 6th December 2016. The Christmas Lights switch on will take place on Friday 2nd December. Lantern Procession with Carol Singing & Lights switch on, Market 5 - 9pm. Saturday 3rd December Father Christmas arrives, live Reindeer, music, food and drink.Market 12 noon - 9pm. Sunday 4th December Children's Disco and competitions in the Quayside Centre, West Looe 1pm, followed by 3pm Louis Evans, 4.30pm Sgt Flynt for the adults, with a bar and Cider and Ale available. Festive Fun Dog Show this Christmas in Cornwall in aid of Children's Hospice South West. Everyone welcome and classes for all - including best puppy, handsomest dog, best long coat, child handler and musical sits! Raffle, stalls and refreshments. This event starts at 6.30pm at the Tall Tees Arena, Davidstow. Family themed Christmas event in Cornwall in the historic town of Liskeard. Turning on of the Christmas lights at Liskeard involving a Christmas themed carnival with lanterns, Carols, activities throughout the day and a visit from Father Christmas. There will be fireworks following the arrival of Father Christmas. Definitely one of the fun things to do in Cornwall this Christmas! The Clovelly Christmas lights are switched on with a procession led by a local brass band and Christmas Carols. Christmas is a magical time at Clovelly. The band leads the procession down to the harbour and accompanies Christmas carols sung with a local choir. A hog roast, punch and mince pies follow and Father Christmas makes a surprise visit. At about 5 p.m. the switch is thrown and the entire village and harbour are lit up. It's a fantastic sight and there is a grand finale of fireworks to finish off. Entrance fee £5 per car at the Visitor Centre after 3pm, all proceeds to the R.N.L.I. Family friendly fun Christmas event in Cornwall raising money for a very good cause. Santas on the Run is a sight to behold. Hundreds of Santas take to paths of the Eden Project in this 2k festive fun run. Santa runs are not about speed or fitness so the whole family is all invited to take part. Whether you have little ones in pushchairs, plan to dance your way around or are looking to set a record time - it's a great day out for everyone! How about trying to get a big team together to help us celebrate our 25th Anniversary year? You can run with family, friends or colleagues - you could even make it your staff Christmas party this year! Entry includes Santa suit, a special 25th Anniversary commemorative medal and festive treats. By taking part in our festive fun run, you and your family will receive free entry into the Eden Project on the day so why not make it a great family day out? There will be plenty of Christmas activities to experience like ice skating and even a trip to Santa's Grotto. Tickets for these activities will be available to buy from early November on the Eden Project's website. Christmas event in Cornwall. The switch on of the St Teath Christmas lights will take place from 4pm on Sunday 4th December 2016. There will be stalls, mulled wine, refreshments, reindeers and Santa! Christmas event in Cornwall. The switch on of the St Teath Christmas lights will take place from 4pm on Sunday 4th December 2016. There will be stalls, mulled wine, refreshments, reindeers and Santa! Santa arrives at 5pm, St Teath Carolers from 5.30 and Santa will switch the lights on at 6pm! What's on in Cornwall this month for those who love Crafts & Christmas! The Shire Hall Gallery in Bodmin is holding a Crafts for Christmas exhibition from 14th November to 23rd December 2016 Monday - Friday 8.45am - 2pm. A range of affordable jewellery, paintings, textiles, gifts and more. All made locally and all great crafts for Christmas. A lovely family thing to do in Cornwall this Christmas - go along for some Christmas gift inspiration! Free admission. TRURO - Children's Christmas Parties at Trennick Mill Restaurant, Boscawen Park, Malpas supporting Children's Hospice South west, Little Harbour. Fancy Dress (Come as your favourite Disney character!) Disco, Wii Sing-it, Arts & Crafts, Buffet, Father Christmas Grotto. Leave the children and enjoy your free time whilst late night shopping in Truro! £10 per child - must be booked in advance. Lostwithiel Dickensian Evening is a great way to get into the Cornish Christmas spirit with this old fashioned Christmas experience. This event for 2016 will be held on Thursday 8th December from 6pm to 9pm. There will be late night shopping with shopkeepers in Victorian costume, choirs, bands, craft stalls, a vintage fair,roasting chestnuts, baking potatoes, there will also be a Church Service, Bell ringing, and a lantern parade. And of course Santa will be making an appearance! Visitors will be treated to festive scenes in the annual Advent Window Trail and Christmas trees along the streets. For more information view the website. Whats on in Cornwall this weekend for those who love crafts - with a difference! Inspired by the contemporary, indie craft fairs The Outlaw Christmas Market will be back to Falmouth this December for its third outing. Perfect Christmas shopping and street food in the lovely harbour town of Falmouth Cornwall , you can really make a day of it! Christmas event in Cornwall for all the family - Marazion Christmas Lights will be switched on at 7.00pm on Friday 9th December in the Square outside the Marazion Hotel in a Christmas event organised by Marazion Decorative Lights Committee and Greenwood Penny Christmas Tree Organisation. Christmas carols will be sung and all are invited to join in with the singing. Family christmas event in Cornwall - Join Marazion Decorative Lights Committee and the Greenwood-Penny Christmas Tree Fund as we switch on the 2016 Marazion Christmas lights! We will be meeting in The Square (outside the Marazion Hotel), for the big switch on at 7pm with carol singing to welcome Christmas to Marazion. Afterwards mulled wine and mince pies will be served in the Marazion Hotel. We look forward to seeing you there! Wonderful live music family Christmas event in Cornwall. Come and join us for an exciting Christmas journey with favourites including, Night Before Christmas, Fairytale Of New York, Toboggan Ride, A Most Wonderful Christmas, Carols and much more. A licenced bar will be open and comfortable table and chair seating. Tickets available in advance: Adult £5, Under 16 £2.50 On the door: Adult £6, Under 16 £4 Under 10 FREE. Advance tickets available from Piglets, Saltash and 01752 844017. ST COLUMB MAJOR in North Cornwall for Christmas - 'Big Sing for Precious Lives' supporting Children's Hospice South West 25th Anniversary at The Silver Ball, St Columb Major. Cornish Pub Singing with Alan Thain, The Bencooleen Wreckers, Fiddle Me Timbers, Larry McLaughlin, Newquay Rowing Club Singers & Guests. All welcome, especially Singers! For more info phone 01637 880606. HOLYWELL BAY, NEWQUAY - Fun Quiz in aid of Little Harbour, Children's Hospice South West at The Treguth Inn, Holywell Bay. £1 per person, no Team Size or IQ! Trophies for all teams and a chance for you to win £50 cash on the night. Plus Grand Christmas Raffle. Family friendly fun Christmas event in Cornwall raising money for a very good cause. Santa Claus is coming to town! Santas on the Run is a sight to behold. Hundreds of Santas take to streets across Cornwall in this 2k festive fun run. Santa runs are not about speed or fitness so adults, children and even family pets are all invited to take part. Whether you have little ones in pushchairs, plan to dance your way around or are looking to set a record time - it's a great day out for everyone! How about trying to get a big team together to help us celebrate our 25th Anniversary year? You can run with family, friends or colleagues - you could even make it your staff Christmas party this year! Entry includes Santa suit, a special 25th Anniversary commemorative medal and festive treats. Cornwall's handcrafted art and vintage Christmas Fair will be showcasing the best local handmade goods and vintage wares, with over 30 stalls from across Cornwall. Sunday December 11th from 1pm to 5pm at the Seiners Arms, Beach Road, Perranporth TR6 0JL. Stalls will include shabby chic crafts, local artists, driftwood creations, up-cycled furniture, photography, original art, unique textile art, vintage fabrics, children's clothing, stunning jewellery and not forgetting a fabulous cupcake and cake stall. For the children we will have face-painting, children's craft activities and a visit from Father Christmas. Look out too for the mince pies, mulled wine...and much more! A family friendly event with an opportunity to buy some lovely presents for your Christmas in Cornwall and after the Christmas Fair you can have a bracing walk on the fabulous Perranporth beach! Money from the cake stall and raffle will go to support the cancer units at RCHT. Sponsored Pram Push on bhehalf of Children's Hospice South West will take place in St Mawgan in North cornwall on Sunday 11th December. Judging at 11 a.m. Start at 11.30 a.m. Route Starts at Carloggas, St Mawgan; Trevarrian; Mawgan Porth; Valley Road to St Mawgan and finish at the Church steps. Annual shield & medals awarded to the following adult and junior teams - Highest sponsorship, Best dressed ladies, men's, mixed and junior teams. Perpetual Cup for the Best Overall Junior Team. For details re: entry, sponsor forms or any general enquiries call 01637 860449 or 01637 860689. Organised by the St Mawgan Horseshow & Gymkhana Committee. A fun family friendly event in cornwall raising money for our Children's Hospice, which does such fantastic work. BBC Radio Cornwall Christmas Concert at Truro Cathedral. A popular Christmas concert each year. Listen to BBC Radio Cornwall for details of when and how to apply for tickets. What's on in Cornwall this weekend if you are looking for a Christmassy event for all the family. Heartlands Christmas Market will take place at various venues throughout the site over the weekend of 17th & 18th December 2016. This will be a festive extravaganza of delicious treats, local products, creative makes, artwork, jewellery and much much more. Festive music from local choirs and brass bands make this one of the great things to do in Cornwall this weekend and with free entry free & free parking too! THE MOUSEHOLE CAT IN MOUSEHOLE THIS CHRISTMAS IN CORNWALL! Cornwall Christmas event at Pool near Redruth. Come and join us for the Christmas Lights Switch On at Bornefit Gym, Station Road, Pool supporting Little Harbour, Children's Hospice South West. Meet Santa 6 p.m. - 8 p.m. Brass band, Refreshments. All donations will go to Little Harbour, CHSW. Saturday 17th December Doors open 6 p.m. for 7 p.m.
MAKE LANTERNS AND OTHER CHRISTMAS THINGS! Christmas event in Cornwall at St Cleer Church. With Cocoa, Mince Pies and Punch Sunday 18th December 2016 at 6pm for about three quarters of an hour. Free event. Celebrate Christmas and join in with the carol singing. Family Christmas event in Cornwall taking place on Christmas Eve. Christingle & Crib service held at St Cleer Church. This is a family friendly event in Cornwall celebrating the Christingle and preparing the crib. Saturday 24th December 2016 at 4 pm for 40 minutes. A lovely service for all to enjoy, especially the children. Christmas event in Cornwall for all the family, including pets at Truro Cathedral! Children and Pets Carol Service. A fun filled carol service for two and four legged friends. No pet too big, no child too small. Great fun. 2pm. HOLYWELL BAY, NEWQUAY - Fun Quiz in aid of Little Harbour, Children's Hospice South West at The Treguth Inn, Holywell Bay. Bring a Team and a Pen. High IQ not required at this Cornwall fundraising event! £1 per person - Prizes to be won. You could win £50 cash if you Play Your Cards Right. All money raised on the night will be matched by The Treguth Inn. Cornwall Christmas event with a difference, this one involves ponies! Cornwall Native Pony Association Christmas Fun Show supporting Children's Hospice South West at Chiverton Riding Centre, 15 fun classes for all abilities. Open to Members and Non-Members. Christmas themed rosettes. £4 entry per class with all proceeds to CHSW. Enquiries call 07946 106649 www.nativeponyassociation.co.uk or find us on Facebook! If you're looking for things to do in Cornwall on New Year's Eve and are in the North Cornwall area head to Newquay which comes alive with a carnival atmosphere in the streets with people dressed up in fancy dress, fireworks by the harbour culminating in a gathering at central square for the count down to midnight. The town of Polperro becomes alive with new year celebrations with many in fancy dress and a good atmosphere in the pubs. The beautiful Christmas Lights at Padstow are switched on the first Sunday in Advent. The Padstow Christmas Lights will be turned on from about 6pm. To accompany the switch on and get everyone in the Christmas spirit there will also be a carol service performed by the Padstow Carolers on the band stand. The Padstow Christmas Lights are a real Christmas treat, there are pretty lights all around the harbour and floating in the harbour water taking various forms including a whale, boat and Christmas trees to name a few. Coverack Art Club are holding an Art Exhibition and Christmas sale event in Cornwall from November 6th - 8th 2015. For sale will be Christmas cards, small paintings and prints. Original artworks can make great Christmas presents, so this event could be a good time to get started on the Christmas shopping. Doors open at 10am and close at 6pm on all three days. RUAN MINOR, nr HELSTON - Christmas Coffee Morning supporting Children's Hospice South West at Ruan Minor Village Hall. Stalls including CHSW Christmas Cards plus Raffle. Hot Pasties at 12 noon. Everyone welcome at this Christmas event in Cornwall raising money for a very good cause. Christmas Gift Fair at Treriefe House, Penzance Cornwall 20th to 22nd November 2015. An exciting Christmas event in Cornwall for all the family over a long weekend. The weekend offers a fantastic shopping atmosphere with great food and designer crafts all under cover in heated marquees making it the perfect opportunity to stock up on an array of fine gifts for the Christmas season. The weekend events begin on the evening of Friday 21st November with the park and house lit by the Newlyn Harbour lights creating a magical atmosphere, whilst local school choirs, singer songwriters and a traditional brass band provide the entertainment. The night is set to offer a fantastic evening shopping atmosphere with local food produce, designer crafts and working craft demonstrations. Inside the house, the Le Grice family will be offering free access to some of their historic rooms, where visitors can listen to stories by Trevor Lawrence about the fascinating history of the local area. The evening culminates in a magical lantern parade by local school children followed by choirs and fundraising activities. Throughout the weekend the Craft Fair will take place all under cover in heated marquees where visitors can browse a range of unique art and craft that cannot be found on the high street. A selection of local suppliers will be on hand to tickle your taste buds, making it the perfect opportunity to stock up on an array of fine foods and drinks for the festive season. Trereife's Courtyard Cafe will also be serving a selection of homemade refreshments. Should you fancy a diversion from the Christmas gift buying and nibbles, Tim Le Grice will be conducting tours of his historic home, allowing visitors to absorb Trereife's extensive history while supping on a glass of Christmas mulled wine. Entertainment across the weekend includes a programme of live music from Brass Bands, School Choirs and singer-songwriters. A free Christmas craft workshop will ensure there's plenty to occupy younger visitors including a traditional fairground carousel and storytelling. Complete with Blacksmithing and basket making workshops and the great smells of seasonal food, the event is set to be a joy for the senses for both the young and young at heart. Cornwall Hospice Care's annual Santa Fun Run is back and even bigger than ever with the 'Late Night Santa Fun Run' on Wednesday 25th November at 7.30pm. Open to men and women, boys and girls, young and old - everyone is welcome to join 'Team Santa' in this festive fundraiser. Grab your fairy lights, decorate the children and get involved. You can choose to run, jog or walk along the route. Sign up and you will receive a free Santa Suit! Join us for a mince pie and hot drink after the fun run to continue the merry making. A great Christmas event in Cornwall for all the family raising money for a very good cause - Spaces are limited, so advanced registration is recommended. Avoid the hustle and bustle and enjoy this Christmas event in Cornwall gift shopping in relaxed surroundings. With Christmas music playing in all rooms, tea and coffee served in the cosy lounge and a range of local craft stalls to browse. Over 20 stalls throughout the hotel including jewellery, local crafts, cards, chocolates and scarves. Entrance Fee £2 per person. Prize raffle in aid of Children's Hospice South West. Light Up a Life is open to anyone, there does not have to have been a connection to either of the hospices, it is an opportunity for people in Cornwall to come together in the spirit of remembrance at Christmas time. The delicious Christmas menu starts at The Falmouth Bay Seafood Cafe in Truro on 1st December 2015 and runs throughout the festive season. You can enjoy 4 courses of wonderful food for Christmas in Cornwall for £29.95 per person. With a choice of 5 starters including winter vegetable soup or vodka cured salmon, 4 mains including a tempting pan fried seabass or roast Cornish turkey and delicious dessers such as a seasonal mulled wine pear or Christmas pudding with brandy butter - who could resist! Fancy escaping to Cornwall this Christmas with your family and friends? Latitude50 are offering £1,000 off their beautiful manor house near Port Isaac for the Christmas week. REDRUTH - A Christmas Charity Concert at St Andrew's Church, Redruth with Redruth's Young Voices & Guest Soloist Mother Shirley. Also featuring St Andrew's Randoms. Admission - Adults £5, Children £3 supporting Children's Hospice South West Little Harbour. Raffle & Refreshments available. SANTA CYCLE & FUN RUN 2015 FOR CORNWALL HOSPICE CARE - SANTA v RUDOLPH! Enjoy a steam train ride and see Santa on board on your journey. Presents from Santa for children and mince pies and seasonal refreshments for adults. Tickets £:13.25 per person (aged 1 and above). Enjoy afternoon tea at this grade 1 listed Mansion house situated on the Lizard. Once a month from 2 until 6pm the library, drawing room and Chapel are open for visitors to enjoy the ambiance of this historical building and partake in delicious afternoon tea and to get you in the Christmas spirit Christmas Carols and free glass of mulled wine. Nice Christmas event in Cornwall in the beautiful village of Port Navas. Mulled wine and mince pies available from 5.30pm followed at 6pm by the lighting of the Christmas tree and singing of carols led by Constantine Silver Band. A traditional Cornwall Christmas event for all the family. The Christmas Lights in St Agnes, Cornwall will be switched on the first Sunday in December. A lantern procession goes through the village before the lights and Christmas tree lights are switched on. The St. Agnes Silver Band will play seasonal music. One of the many Christmas things to do in Cornwall this year. LAST JAZZ AFTERNOON AT THE SEAFOOD CAFE IN 2015! Victorian Christmas Market in the centre of Truro. 67 traders, producers and exhibitors at this 6 day Christmas market on Lemon Quay Piazza. The market is held in a huge marquee and the stall holders dress in traditional Victorian Christmas costume. There is a Food section with meats, cheeses, chocolate etc and an Arts & Crafts Gift Hall for a choice of clothing, jewellry, pottery for Christmas presents! Christmas event in Looe, Cornwall. Pelynt Male Voice Choir sing Christmas carols in the Millpool Centre, West Looe in aid of the RNLI. Family friendly, all welcome. Whats on in Cornwall this weekend for those who love crafts - with a difference! Inspired by the contemporary, indie craft fairs The Outlaw Christmas Market will be back to Falmouth this December for its second outing. Perfect Christmas shopping in the lovely harbour town of Falmouth Cornwall , you can really make a day of it! There won't just be one Santa coming to Newquay this Christmas in Cornwall but a whole sea of them, and this year they won't just be running, they'll be surfing as well! The Santa Beach Run and Surf for Cornwall Hospice Care returns to Newquay, and this year's event will have a new home on Fistral Beach with the return of the popular Santa Surf. Everyone's welcome, young and old, to join Team Santa and help us raise some funds. You can run, jog or walk along the run route, then take a dip in a fun foaming surf contest before joining us for a mince pie afterwards. Spaces are limited, so advanced registration is recommended. Santa Beach Run costs just £12 for adults and £7 for children or £15 Adults and £10 Children to do the surf. Foamie Surf Board hire from Fistral Surf School is included in the price of the surf event. Take on the challenge of both events for just £17 for Children or £20 for Adults. Last Chance Christmas Market event Truro. Taking place on the last weekend before Christmas a bustling market with stalls offering a variety of locally produced food and crafts including cakes, chocolate, cheese, photography, jewellery, pottery and clothing. One of the things to do in Cornwall for those who leave buying their Christmas presents and food to the last minute! Up to 50 stands of hundreds of teddies, new and old, designer and antique. Free valuations and restoration, advice, teddy bear hospital, bear making patterns, kits, materials, accessories and demonstrations and many, many, more attractions including a Free Teddy Prize Draw. This year's event will see the return of AnimalsAisa raising funds to aid Moon Bear Rescue and to end Bear Farming across Asia. Things to do in Cornwall for toy lovers. Cornish Toy Fairs are normally held on the last Sunday every other month at the Lostwithiel Community Centre. We open at 10.30am. and close at 2.30pm. The admission fee is £1 per person with under 16s free and free car parking in the car park by the hall. There is always a wide range of old collectable toys and childhood memorabilia to modern scale models for the railway enthusiast or model vehicle collector as well as books, games, dolls, teddies, tin-plate and anything else toy related. For further information contact either Nigel Walsh on 01726 860963 or 07974041663 or Mark Webster on 01637 871412 or 07887888670. Maureen Crofts, an accomplished artist who lives in Perranporth is holding a sale of paintings from her home in aid of Children's Hospice South West. In support of this very worthy cause Maureen has already raised over £1500. She is an elected member of the Birmingham Watercolour Society, who has had work hung in the Mall Galleries and paintings used as cards by national companies. Her favourite mediums are watercolour, graphite and pastel and she loves trying to capture light, movement and atmosphere in her work. Maureen has recently returned from the House of Lords where she had afternoon tea and was given a prize in the portrait section for her painting of Dave The Blacksmith entered into the EAC Art Awards - this was 1 of 26 prizes out of over 6000 paintings. An impressive achievement! Take a look at the website or go along and see Maureen's lovely paintings - they would make an ideal Christmas present and support a worthwhile cause at this special time of year. What's on in Cornwall this month for art lovers. Kurt Jackson, one of Britain's leading contemporary artists has joined forces with National Maritime Museum Cornwall, developing a new collection of work called 'Line Caught and Local which will open to the public until 25th January 2015.The new exhibition features a stunning series of paintings, drawings, sculpture, supporting film footage and fishing artefacts, as well as a rare glimpse at Kurt's sketch books, offering an exhibition beyond the walls of the artwork and embracing the life and work of inshore fishermen in audio, film and handling objects. The works have been created in situ and Kurt has been working, sailing and filming alongside Penwith fishermen who work out of the harbours and ports of West Cornwall. Using time honoured traditional methods, these men sail off in small boats catching crab, lobster, mackerel, bass, sardines and pollock, working with hand lines, nets and pots in acknowledgment of community based sustainable fishing methods. This is a wonderful art exhibition in Cornwall - one not to be missed! Image - Line Caught Bass from Hayle October 2012 mixed media on board Kurt Jackson. What's on in Cornwall today for those who love the very best produce that Cornwall has to offer. Truro's Annual Christmas Primestock Show is held in a marquee on Lemon Quay in the City Centre on the first Wednesday in December and is a favourite with farmers, country folk and townspeople alike. A very popular event which brings the countryside and farming right into the heart of the City and it is believed to be the only Primestock Show in Britain to be held in the centre of a city, making the Truro Show a unique event. Visitors are able to see at close hand the very best of Cornwall's prime cattle and sheep exhibited, judged and then auctioned, as well as being able to admire a wonderful show of farm produce, cookery, preserves, floral art, photography, crafts and a host of other exhibits. There is always a wonderful atmosphere in the marquee which provides a unique opportunity to see show cattle and sheep literally within a few yards of many of Truro's major shops and stores. Admission to the marquee is FREE throughout the day and evening. Village Christmas event in Cornwall. Carharrack Christmas lights will be switched on on Wednesday 3rd December. Carols from the junior band and coffee and mince pies in the chapel hall afterwards. Morgans at the Barns, St Agnes are holding a series of Christmas Late Night Shopping Events in aid of Children's Hospice South West. the First one is on Thursday 4th December 2014 when they will be open until 8.30pm. Then on Thursday 11th December Santa will be in attendance from 6pm till 8pm. On Thursday 18th December 2014 Santa will be there again from 6pm to 8pm and Christmas Singers The Bluebells will be providing entertainment. Hot Festive Food & Drink available until 8.30pm. A fun Christmas event in Cornwall for all the family and a chance to find some great Christmas gifts. Craft and produce markets at West Looe over the weekend of the 5th & 6th December 2014. Late night Christmas shopping in Bude with a real festive feel including seeing real reindeer, Santas Grotto and the Bude Reindeer Trail. Also Farmers and Craft Market at the Lower wharf where local produce will be on sale as well as crafts. Carols will also be sung though out the night. Christmas event in Cornwall for all the family. Santa arrives in Looe. Join him as he travels across the town towards his glittering grotto. There will be live reindeer, a Christmas Market, food & drink outlets, children's entertainment, a bouncy castle, live reindeer and local choir and dance performances. 2pm - 7pm. Whats on in Cornwall this weekend for those looking for a furniture and interior design event in Cornwall. This event is being organised by Gwer Den Studio who will be showcasing independent traders who deal in Contemporary Design, Vintage, Retro, Shabby Chic, Refurbished, Handmade and everything in between. Maybe pick up some unique Christmas presents! If you are a trader and wish to have a presence at this event please contact Alex on 01209 614693 or message through the facebook page on the link below. The event will run over the weekend of 6th & 7th December 2014 from 10 am to 4 pm at the Heartlands Centre, Pool, Cornwall. Ample Parking available. Christmas Fayre at Carbis Bay Memorial Hall with all proceeds to Little Harbour, St Austell, Children's Hospice South West. Stalls, Crafts, Handmade Jewellery, CHSW Christmas Cards and more... Seasonal Live Music, Raffle, Teas, Coffees, Cakes, Mince Pies, A free glass of mulled wine. A Christmas event in Cornwall with something for all the family. An Evening of Christmas Music by the U3A Carrick Singers supporting Little Harbour, Children's Hospice South West at Emmanuel Baptist Church, Falmouth. Refreshments. free Entry, retiring collection. A musical Christmas event in Cornwall for all the family. Festival of Christmas Trees at Zennor Church, near St Ives. £2 donation welcome in aid of Children's Hospice South West and Zennor Church. Everyone Welcome. Christmas event in Cornwall. The Newlyn Christmas Lights will be switched on at 6.30pm on Friday 12th December 2014. Father Christmas will be making a visit, there will be face painting, fireworks, refreshments, mulled wine, a cash raffle draw and Newlyn School Choir. So, if you're looking for Chritmas things to do in Cornwall this weekend go along to this real family Christmas event in Cornwall and get into the Christmas spirit. For the first year Looe will be holding a Santa Fun Run. Sstarting at around 11am on West Looe quay and featuring and abundance of Santas running around the town. Watch or join in. Christmas event in Cornwall for all the family. Back for the 11th year, the Christmas Fayre will be better than ever! Inspirational cookery demonstrations from leading West Country chefs. Local produce will be available for your culinary delight. If you're looking for that special Christmas gift, there will be a wide variety of crafts and gifts available. Another idea for things to do in Cornwall this Christmas. Admission: Adults £3 each, Children £1 each. The fayre will run 10am to 5pm on Saturday and 10am to 4pm on Sunday. Christmas event in Cornwall in aid of Children's Hospice South West. Lovely Carol Concert with Truro Sinfonia. So, if you're wondering what's on in Cornwall this weekend and wanting a traditional Christmas event this may be the one for you, whether you visit Cornwall or are local - and you'll be supporting a very worthwhile cause at the same time! Pelynt Male Choir present 'Carols at Whitecross' supporting Children's Hospice South West & the Chestnut Appeal for Prostate Cancer at Whitecross Village Hall near Bodinnick. Entrance £5 to include supper. Another lovely Christmas event in Cornwall for all the family. Christmas event in Cornwall for the over 60's at the National Trust Trelissick Garden. Festive two course meal and entertainment in the Barn. Guide dogs only. Booking Essential. Normal admission charges apply. More Information - Alice Watts 01872 861032. Family Christmas event in Cornwall. Mr Grinling, the lighthouse keeper, has lost his Christmas baskets. Can you help him find them before the seagulls eat his Christmas dinner? Organised by the St. Agnes Churches this is an open air carol service by the Christmas tree in Churchtown on the Sunday before Christmas Eve. Family friendly Christmas event in Cornwall. Join Polperro Fisherman's Choir at the Quayside Centre in West Looe singing of carols and seasonal songs. Christmas event in Cornwall organised by St Piran Trust. Who invite you to join them with lanterns, candle jars or torches for carols at St Piran's Oratory on Sunday 21st December 2014 at 3.30pm. The Trust hopes to light the Oratory as the focal point and decorate in holly and ivy. The service will be short due to failing light, but afterwards for those who would like to linger to celebrate the shortest day, the Trust offer mulled apple juice and mince pies. Please join them. The Oratory then will be wrapped up for the winter until more funds are available. Parking allowed at Perran Sands Holiday Park. Note directions given by St Piran Trust - follow signs to reception. At mini roundabout, turn left into car park. Walk back to mini roundabout. Turn left on road, follow sign "Wheal Retreat" then Sign "Piran Point". At log cabin turn right through barrier and follow grit road towards large cross. From here follow Engine Houses signs. Magical Christmas event in Cornwall for all the family. Keltique are holding a candlelit concert in the Church of St Nicholas. Free to all. CHRISTMAS EVE PARTY OF THE YEAR AT THE FALMOUTH BAY SEAFOOD CAFE! Christmas event in Cornwall taking place on the eve of the big day! The girls at the Falmouth Bay Seafood Cafe invite you to join them on 24th December from 1pm - 4pm for the party of the year! Live music and singing from the outstanding swing band, Some Like It Hot, accompanied by the most delicious grand buffet, including fresh shellfish, meat, and vegetarian options. Tickets are only £29.95pp and are selling out fast! Contact Charlotte at sales@falmouthbayseafoodcafe.com or call 01872 278884 to reserve your tickets! The Girls look forward to seeing you soon! Boxing Day Brunch at Cafe Mylor - a great thing to do over Christmas in Cornwall. Mylor Harbour is always a great place for a walk to burn off a little of the seasonal excesses and take in some scenic fresh air. Why not stretch those legs, take a break from the cooking and join them at Cafe Mylor for brunch. Excellent if you are looking for things to do on Boxing Day in Cornwall. Brunch served 11.00am to 3.00pm. Bookings are being taken and so book to avoid disappointment. Cafe Mylor is a dog friendly cafe in Cornwall and so dogs can come along to enjoy the fun. Biscuits and water bowls are on hand for their refreshment. 'A Question of Thought' Christmas Fun Quiz Night supporting Children's Hospice South West at The Treguth Inn, Holywell Bay, Little Harbour. £1 per person - no restriction on team numbers. Trophies for the winners. Plus raffle on the night. 9pm start. All money raised goes to Little Harbour. Fund raising event in Cornwall run by the Wave Project in conjunction with St Ives Surf School. The team from the Wave will be down at Porthmeor to help raise awareness of the Wave Project in West Cornwall which works to help children and young people through surfing. Everyone's welcome to come down and support us and don't forget to spread the word to friends and family in St Ives. Festive fancy dress positively encouraged. Elves may be in attendance! Celebrate New Year's Eve in Cornwall with a whole evening at the Falmouth Bay Seafood Cafe, including welcome cocktail, 7 course dinner and music until late. New Year's Day Brunch at Cafe Mylor - a great thing to do over Christmas in Cornwall. Mylor Harbour is always a great place for a walk to burn off a little of the seasonal excesses and take in some scenic fresh air. Why not stretch those legs, take a break from the cooking and join them at Cafe Mylor for brunch. Excellent if you are looking for things to do on New Years Day in Cornwall. Brunch served 11.00am to 3.00pm. Bookings are being taken and so book to avoid disappointment. Cafe Mylor is a dog friendly cafe in Cornwall and so dogs can come along to enjoy the fun. Biscuits and water bowls are on hand for their refreshment. There will be no ice rink behind the cathedral for the 2014 season. Padstow Christmas Lights from 29th Nov 2015 more about Padstow. St Ives can be a great place to visit at Christmas time. There is a great atmosphere, lots of individual shops for a more personalised Christmas shopping experience, pretty lights and plenty of places for a relaxing eat or drink. Read more about St Ives Cornwall.